Gazing wistfully from under their umbrellas, what the rain soaked inhabitants of the Wirral peninsula wouldn’t give for a little Sicilian sunshine. Well, the good news is that the warm glow of a linguine al limone is practically on their doorstep, at the local Italian Da Piero, which has racked up a series of rave reviews, following up the award of best new entry in the 2010 Good Food Guide with more compliments in the 2011 edition as well as featuring in the Michelin guide. It’s all good publicity for chef Piero Di Bella and his wife Dawn, who runs front of house. Not so good for those looking to book a table. The word is out, and regulars from Merseyside, Manchester and North Wales are now battling it out with food lovers from further south for a prized place in the reservations book. “Last week I went to see my doctor for the annual check. When I opened the door, she said, ‘Oh you are doing very good with the restaurant.’ Why do you say that? ‘Because every time I try to come in, you’re fully booked.’, ” says Di Bella. These few flavours can include Aberdeen Angus beef from Speyside in Scotland, mussels from Cornwall or scallops from the Orkneys. 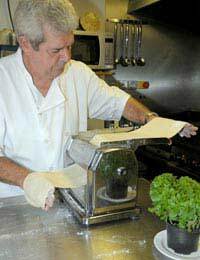 Apart from the meat, fish and vegetables, Di Bella sources all his ingredients from Italy. His standards, not surprisingly, are exacting. “When I opened the restaurant, I ordered 500 kilos of sea salt from Trapani, because salt is very important in Italian cooking. While dishes such as caponata, home-made salsiccia with lentils, and cannoli reflect Di Bella’s Sicilian roots, other regions are represented, too. What inspired these menu choices? "My mother was from northern Italy, born in Piacenza. They were farmers in the Lombardy region. This is why on the menu you can find ossobucco and cotoletta." Lombardy is also represented on the wine list, alongside bottles from Tuscany, Veneto and Sicily. Piemonte is soon to gain representation, too. Future plans include an expansion of the kitchen to include a fresh pasta station. "A larger preparation area will allow me to do many things that at the moment I cannot do, such as ravioli. I love ravioli, I love making ravioli, indeed any type of pasta. When you serve fresh mushrooms, for example, you have to serve them with fresh tagliatelle, because they are delicate types of mushroom. It is very important." And what about increasing the number of covers? "If we expand we will never make a restaurant with 50 covers because that is a different kind of organisation. But 30 people between me and my son, Alan [who qualified as a chef three months ago] is possible." Da Piero’s doors are open from Tuesday to Saturday, although other days can be accommodated upon special request. For the Di Bella family, this means long hours. Not that the chef is complaining. "It is hard work. If you are not passionate, don’t do it because the passion is the driver of the restaurant. It is tiring but it is so satisfying when you get the compliments from people; then the tiredness goes away."